Parental rights and custody are two different things. 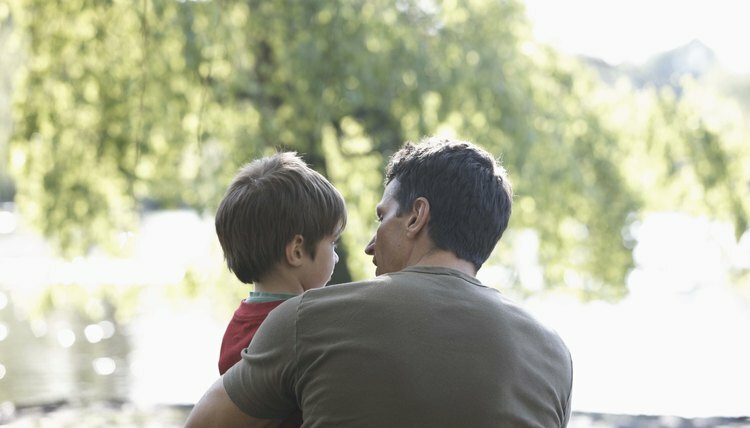 A custody order does not terminate a father’s parental rights. Only a separate court proceeding can do that. For example, custodial parents might undertake such proceedings so stepparents can adopt their children. A juvenile court might also terminate a parent's rights if he is such a danger to his child that social services has removed her from his home. Termination of rights severs any legal connection between parent and child, whereas custody orders simply outline who the child lives with and who makes important decisions on her behalf. Unless the court terminated your parental rights in a separate legal proceeding after your divorce, all your parental rights remain intact after the death of your child’s mother, just as they would if she had lived. Custody and guardianship are also two separate issues. If you’re divorced, your decree includes the terms of your custody arrangement. If you and your ex modified custody after your divorce, a separate order usually memorializes your current arrangement. Either way, custody is a legal situation between you and your ex. If she has died, she is no longer a party to your custody order. You’re the only parent bound by it under these circumstances, so full custody automatically reverts to you. Therefore, in most cases, the only way your child’s grandparents can achieve guardianship over your child is if you -- as the parent with custody -- assign it to them. This is true even if your ex nominated them in her will. The usual custody rules don’t always apply if you were never married to your child’s mother. If you never legally acknowledged paternity, you have no parental rights. If you acknowledged paternity but never sought a custody order to establish visitation or parenting time with your child, custody can’t automatically revert to you when her mother dies. If you find yourself in this situation, confer with an attorney. In most states, you’ll have to first claim your parental rights through a legal proceeding to establish paternity. This is normally a simple procedure, but it becomes much more complex after the death of your child’s mother, because there’s no other living parent against whom you can bring such a lawsuit. After your paternity is established, you may then need to initiate a separate legal proceeding to override the terms of the mother’s will. The probate court would likely honor her wishes and name the guardians she selected in her will, unless you intervene. Your child’s grandparents may petition the court for guardianship, if you don’t voluntarily give it to them. Generally, they would have to prove you’re unfit to act as your child’s parent. They can also petition for custody on these same grounds. However, if you’ve had an active role in your child’s life, the odds of their success are minimal, at best. The law always presumes a child is better off with her parent than with any other adult. Natural parents have a “prima facie” right to custody before anyone else, even grandparents. This essentially means the court will take custody away from you only under extreme circumstances, such as if you’ve neglected or abused your child. Does the Stepfather Have Rights to a Child If the Father Is Still in the Picture? If you're concerned what will happen to your relationship with your stepchildren after the dust of your divorce has settled, you probably have good cause. Stepparents don't have automatic rights to custody. This rule generally has less to do with their biological father than with your spouse – if she already has custody of the kids from her last marriage or relationship, she's probably calling the shots now that the two of you are parting ways. What Happens to My Kids if I Die Without a Will & I Am Divorced? No one wants to think about dying and this may be particularly true when you have young children. However, preparing for your death is the best way you can protect your children from any legal fallout that may result from it. If you don’t leave a will, you'll entrust their fate to decisions made by an impersonal court.